Introduced back in 2011, the Sony DT 16-50mm F2.8 SSM is a wide-aperture standard-zoom designed for Sony’s APS-C-format SLT models. As the equivalent to a 24-75mm standard zoom with a fixed f/2.8 maximum aperture, it is intended to appeal to enthusiasts and professionals alike. Besides the fast maximum aperture, it has high-end specs, including a sonic-type focusing motor, weather-proof sealing, and circular aperture blades for rendering rounded specular highlights and smooth transitions to out-of-focus areas. The optical construction consists of 16 elements in total arranged in 13 groups, with a mix of aspherical surfaces and ED glass. The lens focuses to 1.0 foot (30.50 cm), and with a 72mm filter diameter, measures 3.19 x 3.46” (81 x 88mm) and weighs 20.35 oz (577g). It is available for around $799 (USD). 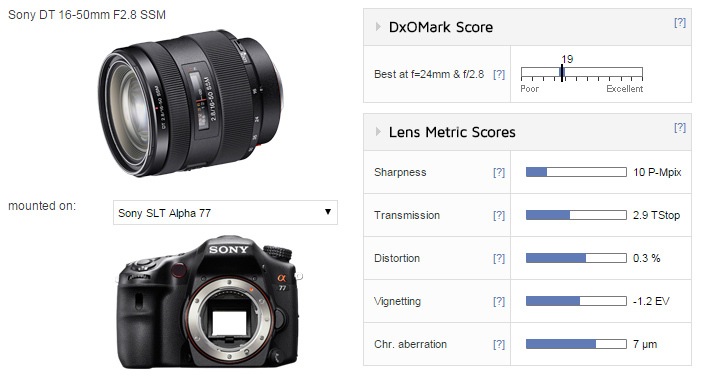 With a DxO Mark lens score of 19 points on the Sony SLT A77 (with which it was bundled as a kit back in 2011 and the most up-to-date model available to us at the time of testing), the lens is a good performer overall, but it’s not without some shortcomings. Sharpness is very good across the field at the middle focal lengths (24-35mm), especially when stopped down slightly, but edge sharpness is on the low side wide-open at either end of the zoom range, and particularly so at 50mm. At the other end, at 16mm, it has some complex (mustache-type) distortion and noticeable chromatic aberration wide-open, although the fringing reappears when heavily stopped down at 35-50mm. 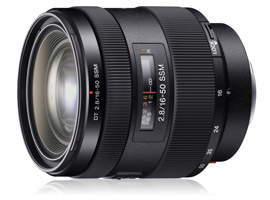 Compared with the Sony-made, Zeiss-branded DT16-80mm f3.5-4.5 ZA introduced back in 2006, the Sony 16-50mm F2.8 is ahead overall in optical quality. Although it has similar peak sharpness levels, the Zeiss-branded model is sharper across the image field at 16mm at f/3.5-4 (and without the complex distortion). The Zeiss is also more uniform generally than the Sony at shorter focal lengths, though it often can’t reach the same peak sharpness centrally. Both show troublesome field curvature at 50mm, the Sony more so on stopping down, while the Zeiss is more noticeable wide open, but it then performs well at 80mm in terms of sharpness, even if the maximum aperture is a slow f/4.5. 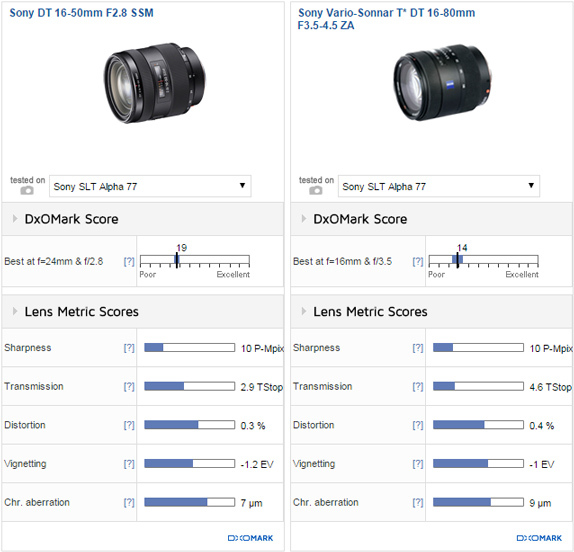 The Sony has good center sharpness at most focal lengths at the apertures shown above, but only occasionally matches the Zeiss for uniformity. Third-party makers Tamron and Sigma offer similar models, complete with stabilization and sonic-type motors like the Sony, at prices around $100 less. While we don’t have data for the Sony-mount versions, we have results for those models mounted on the Nikon D7100, a camera with a sensor that is suspected to be related to the Alpha 77’s. Both rivals offer similar levels of performance overall, but offering slightly improved peak levels of sharpness. 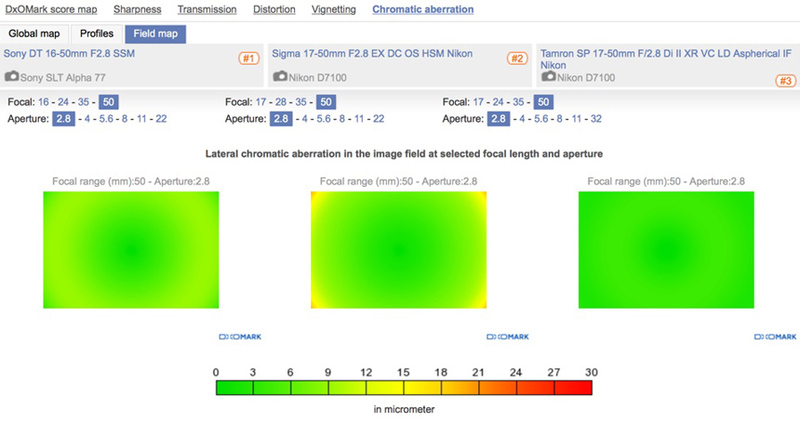 The Sigma is the best of the three models at the initial aperture. It has high central sharpness throughout the zoom range, though like the Tamron, it has rather low sharpness at the edges and corners, especially in the 28–35mm range. Both models are sharper than the Sony at 50mm, and have superior uniformity across the image field, with the Sigma slightly better than the Tamron in that respect. 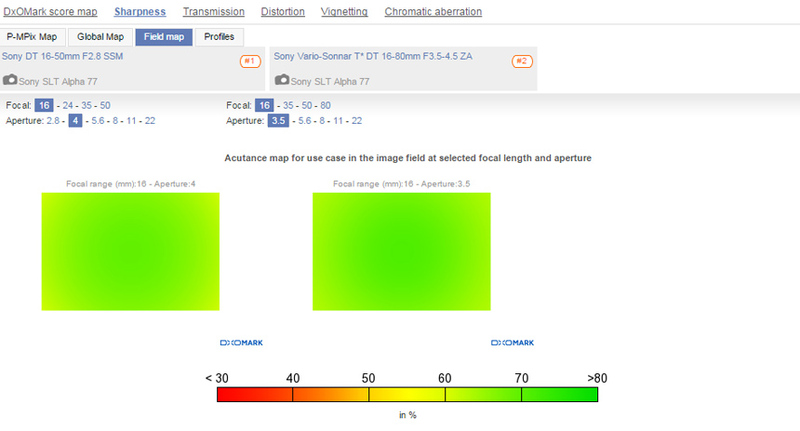 Interestingly, the Sigma and Tamron show similar levels of complex-type distortion as the Sony. Another downside for the Sigma, at least, is the presence of chromatic aberration in the corners at 50mm. 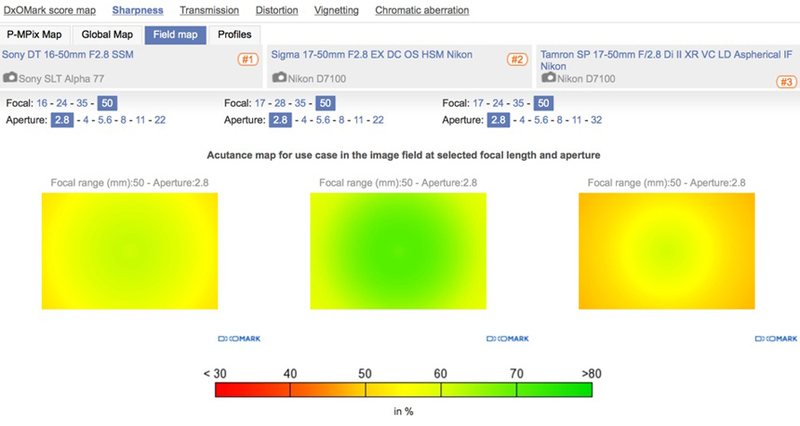 The Tamron is well-corrected for lateral chromatic aberration and has very low vignetting at 50mm. However, neither model can compare with the Sony’s excellent transmission. 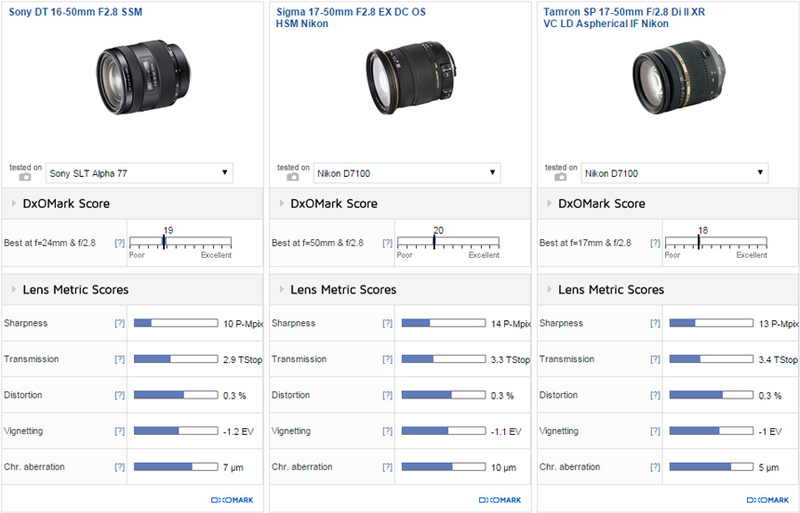 All three models have good sharpness levels generally, though the Sigma is ahead slightly and performs very well at 50mm from the initial aperture onwards. The Tamron has similar characteristics to the Sony at 50mm in terms of lateral chromatic aberration, but levels are lower. The Sigma has a different profile, with high levels in the corners. Although the Sony has good center sharpness throughout much of the range, the exception is at 50mm, where field curvature can be problematic and stopping down doesn’t help. It also has quite noticeable chromatic aberration at the edges of the frame at 16mm and when stopped-down mid-range (24-35mm), making it look like a somewhat problematic lens. On balance, however, after taking the high speed aperture, stabilization, sonic type motor and price into account, it remains an attractive option for Sony users. But if brand loyalty isn’t a concern, potential buyers could look at the offerings from Sigma or Tamron.